November 25th is National Parfait Day! 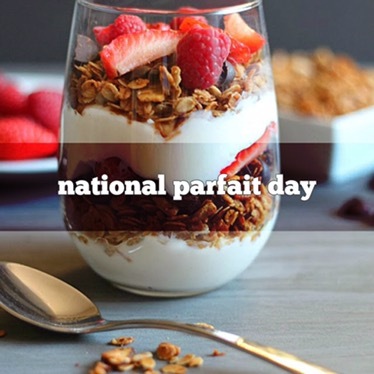 Parfait is a French word that means perfect. It is often served in a tall, clear glass and topping creation with whipped cream and fruit. The oldest recipe with the name parfait comes from a French cookbook dated 1869. The original parfait recipe was a frozen coffee-flavoured French ice dessert constructed in parfait-shaped (tall and thin) ice cream moulds. French style parfait is served on decorated plates instead of tall, thin glassware. 1715 American Sybilla Masters was the first American granted an English patent. It was for a method of processing corn. 1846 Carry Amelia Nation was born. Well known temperance movement activist, she was famous for destroying saloons with a hatchet. 1884 John Mayenberg, of St. Louis, Missouri, patented evaporated milk. 1967‘ Incense and Peppermint’by Strawberry Alarm Clock hits number one on the charts.